And now for something rather different. (You thought I was gonna say "completely", didn't you? As a matter of fact, I was.) 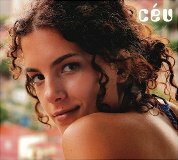 CéU comes to us from Brazil, which even I could figure out from about five seconds of Vinheta Quebrante, which Altavista's Babelfish translates as Vignette Breaks, not that that helps me any. But not knowing what she's singing about doesn't stop me from enjoying every moment; her voice is like that. Soothing and seductive. Makes me want to pay another visit to her homeland. Ana Moura is a fadista, a performer of fado, a style of Portoguese folk music which has been likened to Spanish flamenco at least in its local significance. It is largely confined to Lisbon and the university town of Coimbra, both of which I've visited (briefly), sadly without experiencing fado. But better late than never; it's a style of music that gets under your skin, at least as Ana Moura performs it. And in a musical world of ever greater homogeneity, there's pleasure in hearing something you don't hear every day. Unless you live in Lisbon or Coimbra, I suppose. And now for something completely different. 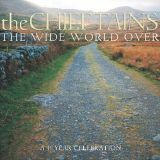 With a name like Enter the Haggis, we can hardly be surprised at this band's upbeat Celtic sound. I was assuming Scotland, or at least northern England, but I'm wrong again. (Yeah, big surprise.) They're actually from Toronto, which, last I checked, is more than a few stones' throw from the old country. Not that I'm complaining; Canadian accents are a whole lot easier to understand. Way back in April I mentioned Pink Martini and the unsettling cover they did of Qué Sera Sera, which wasn't available on the iTMS. Now it is, along with the rest of their two albums. This second release is rather more polished than their debut, which sounds like it was recorded through gauze. Come to think of it, isn't that how they used to film Doris Day? 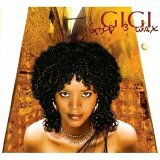 Gigi is Ejigayehu Shibabaw, an Ethiopean vocalist who combines her impressive range, her musical heritage and a more western sensibility and ends up with something that's easily more than the sum of its parts: seductively neither African nor European and yet strangely familiar. But before I even got to sample a few tracks, I had to laugh at the Top Songs list on the iTMS. It seems the store confused this Gigi with a whole 'nother Gigi. A natural mistake, I suppose. At least if you're the sort who doesn't know one furriner from another. But just to keep them straight, this one's musical, the other one's a musical. Are we clear now? I was a Boy Scout. Not a very good one, I grant. 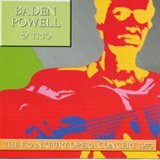 But enough of one to stop when I saw the name Baden Powell on this album. Turns out this Baden Powell was a Brazilian guitarist named for his grandfather, whose own father thought highly enough of the Scouts to name his son after their founder. Which explains how a Brazilian ended up with such an English name. And none of which matters, except for the serendipity of my encountering a truly amazing talent. Baden Powell's music sounds to me like Spanish guitar, although I suspect an aficionado would identify all kinds of differences. But no matter; his playing here, both as part of his trio and on its own, is energetic and thrilling. Some years ago I joined an old friend and her part-Cherokee husband to a Native American powwow in Gilroy. I remember it as a long afternoon: hot, dusty and filled with an endless and to my ears monotonous chanting and drumming. Not one of my more interesting memories. Which is why I was surprised when I started listening to Intonation. 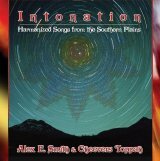 Because although the tracks are unmistakably Native American and consist of a duet of unadorned vocals, those vocals are a wonder to behold. That word Harmonized from the album's subtitle tells part of the story: two voices join and separate and soar and dive and mix in all sorts of interesting ways. And there are lyrics to some of the songs, which as best I recall wasn't part of that earlier experience. Some are in English, others are in some Native American language. But my understanding what they're singing about doesn't matter nearly as much as the fact that I know they're singing about something. I could try to make some clever remark about my growing interest in foreign cultures, or about the fact that in this case, it's my culture that's the foreign one. Heck, I just did. But Intonation is interesting for itself. It's music like I've never heard before. And want to hear again. From what I can gather, machine translation being what it is, Svetlana Skorobogataia is from Byelorusse and performs on an instrument called a zymbaly, whatever that might be. 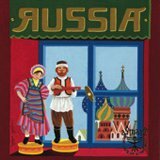 Although the iTMS has this album called Russia (with a backward first R) from an Italian record label, a German website has the identical set of tracks under the name The Magic of Zymbaly. Which still tells us nothing, although I was able to gather that Ms. Skorobogataia is accompanied by an Italian pianist on her collection of what I assume are (at least mostly) folk tunes. Among them is Midnight in Moscow, a childhood favorite about which I blogged almost exactly a year ago. Which I know is irrelevant to today's post, but until somebody explains the zymbaly to me it'll just have to do. Or better yet, enjoy them uncombined. With or without green beer. Like most people in the West, I discovered Ladysmith Black Mambazo when they provided backing vocals on Paul Simon's amazing Graceland back in 1986. I remember that Simon got some grief over that, with accusations of exploiting the group and their culture for his own purposes, as well as for cooperating with the Apartheid regime then still in power in South Africa. Things have changed more than a little since then; Raise Your Spirit Higher commemorates the tenth anniversary of the end of Apartheid. And the group's vocals are even more powerful without Simon's pop sensibilities. Their blend of Christian gospel and a South African miners' traditional song style called isicathamiya speaks to us of the will to endure in a way that goes beyond mere words. 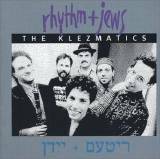 I first heard The Klezmatics on a public radio show called West Coast Live, where they made regular appearances. And I knew their name came from something called a klezmer, although I was under the impression it was some kind of musical instrument. On the off chance that you're as ignorant as I, let's get that one straightened out. Klezmer isn't an instrument; it's a style. A contraction of "klei zemer" (musical instruments), it refers to a mix of Greek and Central and Eastern European music played at Jewish celebrations. It's dance music, of a particularly lively and unsubtle kind. Think of it as Jewish jazz and you won't be far off. I like ethnic music, at least in concept. (And generally in small doses.) Maybe that's what bugs me about Christmas music, that it isn't different enough. Challenging enough. Klezmer is certainly both. As the iTMS grows ever more international, it gives us the chance to explore a vast array of musical styles. Ella Leya is from Azerbaijan; her music is a combination of Middle Eastern and Russian with other influences. A lot of it is soft and haunting, like the Kabbalistic Prayer that made an appearance in Oceans 12. Some are wistful and romantic like I Close My Eyes. And then there's He's Just a Little Boy reminds me of my Russian grandparents, overlaid with with a sound of sabbath prayers. I've spent a little time in Israel and a very little in Egypt. Here is the sound of a place and an attitude. It's a sound I don't hear very often. That's a real pity. A recent article in Boing Boing discussed an odd hyphenate: a Mexican-Yugoslavian connection in music and cinema. It came about in the 1950s over the hostility between Marshal Tito and Stalin. Yugoslavia suddenly needed a new source of entertainment that wasn't Russian, preferably one that was in tune with the new revolutionary tone in its own country. And apparently Mexico fit the bill. My discovery of Natacha Atlas was pure serendipity. I'd been watching one of the extras on a James Bond DVD; it was about Danny Arnold, who wrote the music for Tomorrow Never Dies. And it mentioned a CD he'd produced of covers of Bond songs. I went searching in all the usual places for the CD, which apparently was never released in the US. Even worse, it appeared to be out of print in the UK. So I tried the less legal sources of music. (Shhhh! Don't tell the RIAA!) And I found an amazing version of From Russia With Love by someone named Natacha Atlas. Her Middle Eastern singing style is an natural fit for a story that takes place in Istanbul. And one I wanted to hear more of. The iTMS to the rescue. I was surprised to find several of Ms. Atlas's albums on the store. Gedida is my favorite so far. with performances of equal grace in English (One Brief Moment), French (Mon amie la rose) and Arabic (the other nine tracks). Not your ordinary listening, at least in this part of the world. Sadly, there's no From Russia With Love on the iTMS, at least not from this artist. But she does have a kickass rendition of You Only Live Twice. That's something. You can find interesting music almost anywhere, although I can say from personal experience that the odds improve dramatically if you stay far away from Don Ho concerts. Mr. Ho aside, there's some amazing music in Hawaii. And some of it even involves the ukulele, an instrument that was nearly dead and buried with the arrival of Tiny Tim. 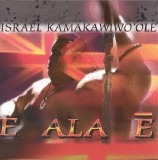 I mention all this as an unnecessarily drawn out introduction to Israel Kamakawiwi'ole, a giant of a man with a haunting voice. I discovered Iz while searching the net for a recording of What a Wonderful World for a music video project. Instead of Louis Armstrong, I discovered wonderful performances by Eva Cassidy and Iz. I used Ms. Cassidy for my video, but kept coming back to Iz. And loved the rare beauty of Wind Beneath My Wings and the raw power of his rendition of the theme from Gilligan's Island. Anybody who can give dignity to Sherwood Schwartz is truly touched by the gods.